Driving can be one of the most exciting day to day activities for the average person, but no matter what vehicle you’re driving or how skilled your technique is, there are some roads that you just have to wonder who is actually skilled enough to travel them. Taking a look at the following list will give you a good idea of whether your skilled enough to drive it or perhaps rich enough to make it safer for the rest of us. Bolivia: This road cuts through the Bolivian Andes, running almost 70 km from La Paz to Coroico. It travels nearly 3,600 meters down and is comprised almost entirely of narrow hairpin curves. Unfortunately, their is no safety net below off the side of the road, and as you can see from the picture, the drop is quite severe. While you’re smart enough to read about this road before attempting to travel it, between 100-200 people a year over estimate their driving abilities, leading to their unfortunate death. Constructed in the 1930′s by Paraguayan prisoners, it would be easy to assume that they built it to be this treacherous on purpose. 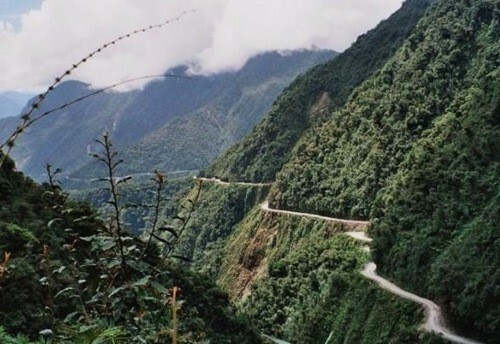 North Yungas Road is most frequently traveled by trucks and busses, which makes it’s span of merely three meters wide almost as terrifying as looking out the window when on it. If you still don’t fear the “Road of Death” be warned, these conditions are only what you would experience in the dry season. Let’s hope you don’t get stuck there in the rain. looking to travel to Yakutsk, this is road is the only option you have. As you can see, you’ll be traveling on more mud than actual road so let’s hope you’re friends with a local tow truck driver! Expect traffic to come to a stop as many will wait for this 30 km long road to dry enough to considering driving on. But being a mud road isn’t the only thing that makes it dangerous. Many expects suspect underground gas leaks, supported by the reports from a majority of motorists who have survived car accidents on this road claiming that they can’t remember what happened. Perhaps Yakutsk isn’t worth visiting after all. Guoliang Tunnel in the Taihang Mountains, China Before May 1st 1977 the only hope of making it to the small village on the other side of the mountain was to follow the along the rock foot path. In 1972 workers began a five year process of creating this 1,200 meter long tunnel, spanning 4 meters wide and 5 meters high. Wear and tear over the years has caused this tunnel to become uneven, but don’t worry, the view from the thirty plus windows will make your journey on this road even scarier. Taroko Gorge Road, Taiwan. While this road doesn’t offer the twists and turns you’ll find from those above, you’re still riding on a wide open mountain side. Although an absolutely beautiful sight to see, don’t take your eyes off the road unless you happen to have a car parachute. Your best bet to enjoy this beautiful scenery would be to take a tour bus across it, unless of course your looking for a more scenic grave.